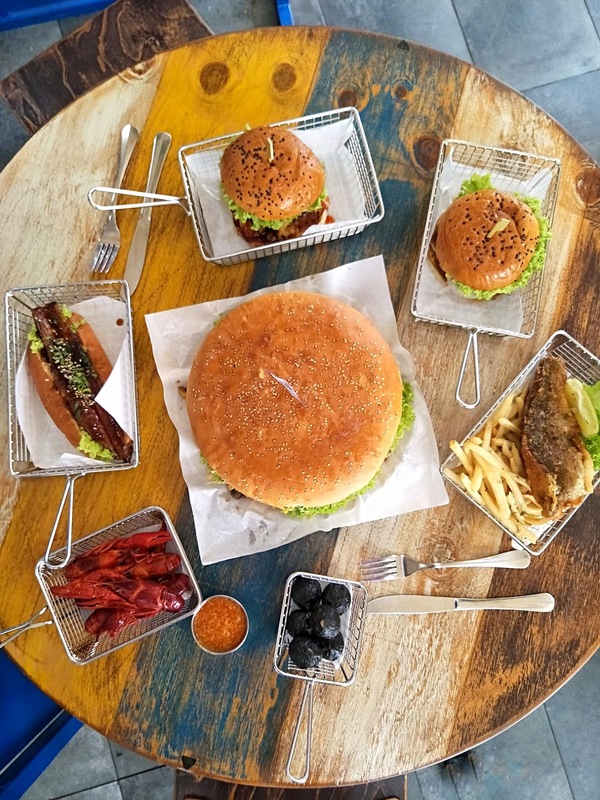 If you still don't know, I'm a huge fan of BURGERS! So while this visit to the latest baby of Chicken Up is a food tasting invite, there wasn't any obligation to put up a blog post about it, so you can take this as a 100% honest review. 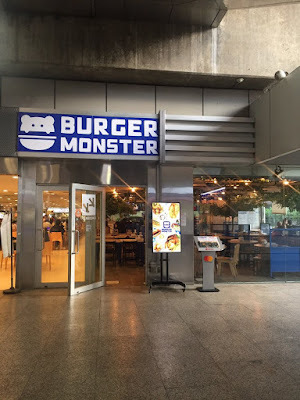 Located at a corner of Jurong East MRT Station, just below the platform at Level 1, it might be easy to miss the eatery if not for the cute Burger Monster icon on their distinctive white-blue signboard (and "mis-match" Chicken Up's chicken feet logo on the glass panel). All these crazy amount of food for just 5 of us (out of which 4 of us are ladies). But we were quick to concede to our impending failure and quickly call-out to our respective partners for help. HAHAHA. So in the end, a total of 8 pax (4 couples)... still COULDN'T finish all these food. A lonely slice of the insanely big monster burger was leftover in the end. With their standard, and yet still pretty big (like a McD Big Mac), sized burgers going for $5 to $6 dollars, breadrolls at $3 to $8, and other mains (fried fish & chicken etc) going at $4 to $6, this newly opened Korean burger joint has definitely scored a brownie point for offering you quality food with extremely affordable prices. 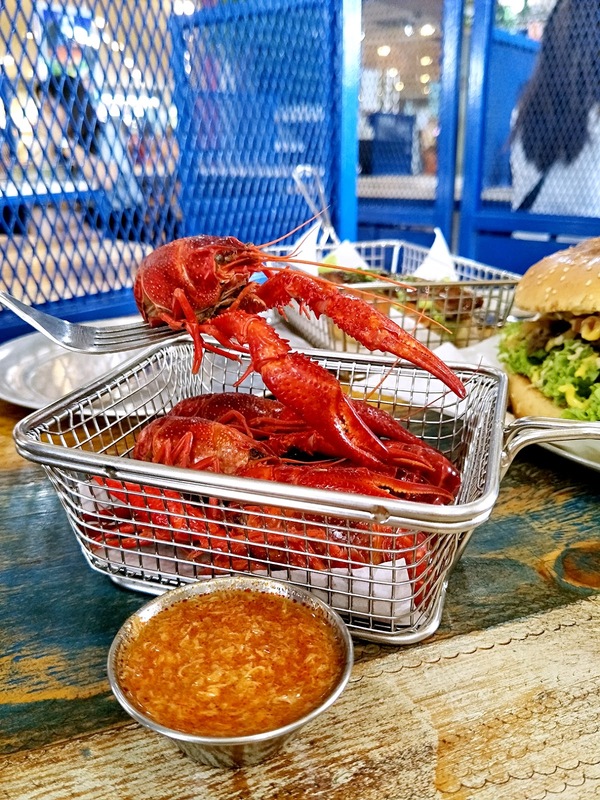 Burger Monster also offers a wide variety of small bites and sides, ranging from $2 (Garlic Fried Rice) to $12 (Mini Lobster with Chili Crab Sauce). To make your burgers/mains a full meal, just top up an additional $3 for fries/garlic fried rice + drink, or $5 to make your drink free flow! There's also a condiment bar in the eatery, providing 8 different types of sauces, such as cheese, wasabi mayo and yangnyum etc, for you to try out! But I guess their most popular dish (that's highly raved on IG) has got to be this massive, 1KG birthday cake lookalike, 22cm big Monster Burger, which comes in either Beef or Chicken Bulgogi flavour. 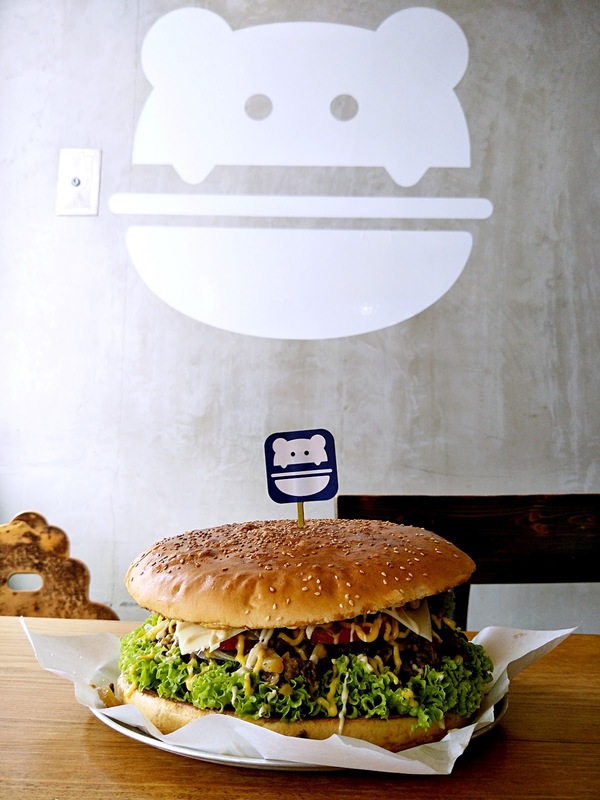 Priced at just $20 for this ridiculously huge burger, you can easily feed 4 hungry men with it, no joke. I would even recommend up to 6 (ladies) with a small selection of sides to share for a more comfortable, non-tummy bursting meal. Couldn't try this Monster Burger out because I don't take beef, but I did cut pieces of the huge buns to try out and instantly got ADDICTED. These buns are so fluffy, and even slightly crisp at the edges. I think I must have (at least) asked the BF to "cut me a piece of your bread" at least 4 to 5 times while he's eating his two slices of the insanely oversized burger. This has got to be my favourite burger of the day! Thick fillet of fried shark meat topped with (a lot of) shredded onions, sliced tomatoes, fresh lettuce & cheese, and sandwiched between two extremely soft and fluffy buns. The shark fillet is also generously drenched with a spicy and slightly sweet (yangnyum?) sauce that probably helped/serves to cover the otherwise distinctive "fishy" smell of shark meat. And the sauce must have done a great job, because I couldn't taste that "fishy" taste of shark meat at all. The meat was also more moist and tender as compared to our usual dry and tough stir-fried shark meat. My only complaint is, the burger is too big to be eaten.... well, like how a burger should be eaten. It is absolutely impossible to get a bite of everything with one bite. Pretty sure all of us ate it the deconstructed-burger way. Even though this pales slightly in comparison to the Shark Burger, I can't deny that it is still a very good chicken burger. There wasn't any special sauce to oomph up the flavour, but the grilled chicken was thick, tender and still pretty juicy. And well, you can always add whatever sauce you fancy to this burger over at the condiment bar, so all is good! The other two mains, the Unagi Roll ($8) and Fried Seabass ($8) unfortunately didn't do very well at impressing us. I completely skipped the Unagi Roll (because I really dislike Unagi, sorry!) but both the BF and Oyhz claims that the breadroll and the unagi tasted like separated dish. I also found that the breadroll didn't really hold up very well with the unagi, sauce and all. Just a small slice of my knife and the whole unagi roll disintegrated upon itself. As for the Fried Seabass, it might have been because we took way too long at taking photos, so much so that it has turned cold and harden. If it's not for the fact that there's another 7 pax waiting to try a bite, I would have just stick my fork in, pick up the entire fillet and take a bite directly out if it. Slicing it was just like slicing through rubber. The meat was also dry and a little tough, probably overcooked. And now for the two dishes which were quite highly anticipated, but failed to deliver. 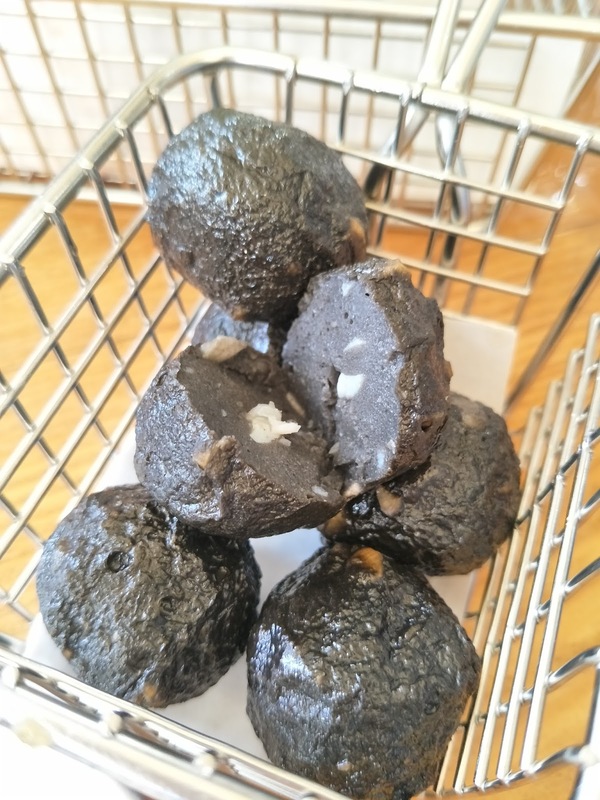 The black ball was pretty much just, sotong ball made black. 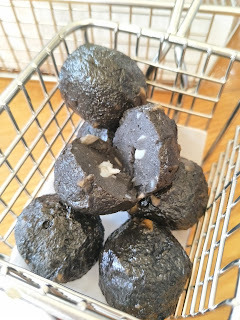 Not sure if they've added in squid ink or not, but... it really just taste like your standard sotong ball, except that it's black. At one point I strongly believed that something special must be hidden within the ball, but there was absolutely nothing. The white bits you see are just small chunks of sotong. As for the mini lobster, it's really.... tiny. All the effort of peeling the shell, only to get the meat that's equivalent to HALF the size of a shrimp. 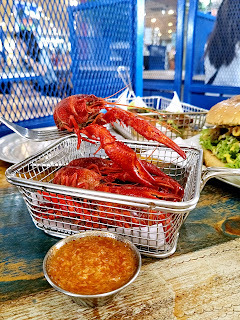 But to be fair, the chili crab sauce does taste pretty decent though. and is open daily from 11am to 10pm.